By Chloe Barnett, BScReviewed by Dr. Tomislav Meštrović, MD, Ph.D.
Conjugated antibodies are used in different clinical and non-clinical approaches. For example, antibody-drug conjugates (ADCs) and radioimmunoconjugates (RICs) may be used in the clinic for the delivery of therapeutics, whereas antibodies labeled with a fluorescent tag may be used in the laboratory for immunofluorescence and western blot analysis. A wide variety of molecules can be used for conjugation, and their selection is dependent on the purpose of the antibody conjugate, as well as the preferred method of conjugation. In vivo applications (ADCs and RICs) benefit greatly from site-specific conjugation techniques, whilst in vitro uses (immunofluorescence and western blot analysis) more commonly involve classical amino acid residue conjugation. In vitro antibody conjugates only require the maintenance of antigen binding specificity and affinity, whereas in vivo applications must also have specific modification sites and payload-to-antibody ratio. This ensures safety and efficacy. 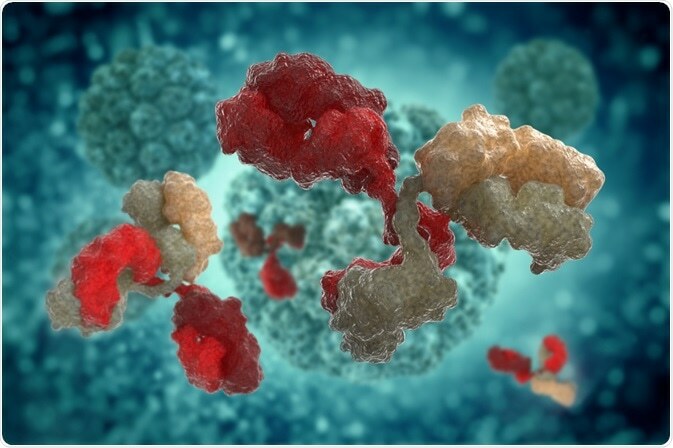 For antibody-based assays (immunoassays), the antibody used to detect the antigen of interest must be conjugated to a molecule that can be detected, often referred to as the label. IgG antibodies, which are commonly used for immunoassays, contain regions that are not actual antigen-binding sites that have the propensity to bind a labelling molecule (such as enzyme or radioisotope). Cytotoxic drugs bound to tumor specific antibodies (ADCs) are a revolutionary way of delivering cancer treatments. They hold many tremendous benefits such as reduction of systemic toxicity, increase of cell-killing potential, as well as patient drug tolerability. While the conjugation of radioactive molecules to tumor specific antibodies in RICs also help in delivering radiotherapies to a patient, they can also be used for accurate imaging studies of the cancer. There are a myriad of different sites that can be used on an antibody to bind the conjugate; these are primarily strong protein-protein interaction (e.g. Fc-binding domain), engineered cysteines, natural amino acids, nucleotide binding sites, non-natural amino acids, the N-terminus of the heavy and light chain, the carbohydrate moiety and engineered tags. When using engineered or reactive natural residues as conjugation sites, which is typically lysine or cysteine, there is a challenge to control the stoichiometry of the reactions and produce consistent antibody species. This has led to the development of techniques such as site-directed mutagenesis, but also others that include numerous enzyme steps or varying protein hosts. Although nearly all amino acids could be potential candidates for the conjugation site, the reactive thiol in cysteine and the nucleophilic primary amine in lysine are generally chosen by researchers. Site-specific conjugation differs from the typical amino acid residue conjugation. The primary reason is that, unlike the amino acids abundant in antibodies (such as lysine or cysteine), site-specific conjugations bind molecules only to the unique and specially selected site that has been made through a carefully engineered antibody structure. During conjugation, reactive groups on the label (B) and the antibody (A) form a covalent bond with each other. There are two main types of antibody detection methods: direct and indirect. This means that labelled and detectable antibody can either be directly attached to the antigen, or attached to an unlabelled antibody that has bound to the antigen of interest (the latter representing an indirect method). In any case, the indirect method has more incubation and wash steps, whereas the direct method removes the risk of non-specific binding occurring on the secondary antibodies which will produce misleading results. There are a number of different options when choosing a label that contains a reactive B group, for example: biotin, particle, enzyme, dye, fluorescent protein and streptavidin. This decision is vital and will affect how the investigator treats their antibody and determines the modifications that they antibody will require. A textbook can be referred to which contains a list of functional groups in antibodies, as well as the associated conjugate chemicals and reactive groups that could be on the label. Although there is an extensive list of options, popular reagents used in this field are Lysine and paired Glutamate and Aspartate (antibodies); EDC, 2-IT and SMCC (conjugate chemicals); and Maleimide, NHS (succinimidyl) and Thiol (conjugate chemicals). Avoiding the need to modify the antibody when choosing a functional group is important as direct reaction of the label reactions groups (B) to the antibody in its native form and will reduce the number of steps required. Most labels are commercially available and do not require the investigator to produce their own. Reed R, Holmes D, Weyers J, Jones A. Practical Skills in Biomolecular Sciences, 4th Edition. Pearson Education, 2013. Chloe has a B.Sc. in Medical Sciences from the University of Leeds and during her time there she enjoyed being close to the Yorkshire dales. 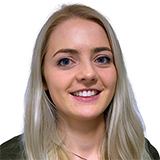 Chloe loves the outdoors, spending her spare time hiking and exploring the UK countryside as well as listening to live music and running.